Please Avoid Shooting Collared Mountain Goats! During 2013, ADF&G in cooperation with the Kodiak National Wildlife Refuge has radio-collared mountain goats throughout Kodiak Island. Please take a moment to review the informational flyer about collared mountain goats before heading out. Thoughts of Kodiak generally conjure up images of a lush island filled with large brown bears and plentiful Sitka black-tailed deer. 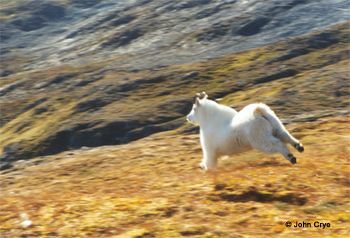 Yet, the Emerald Isle has another, less obvious, hunting opportunity--fantastic mountain goat hunting. 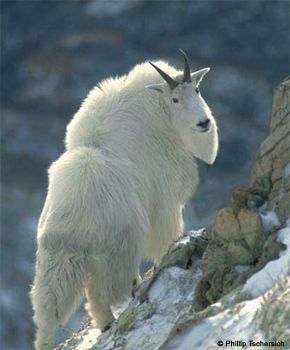 Kodiak's mountain goat population originated from 11 females and 7 males, which were transplanted from the Kenai Peninsula to the Hidden Basin area during 1952 and 1953. Success of the transplant was not realized until 1964 when 26 goats were observed in the Crown Mountain area. The first hunting season was authorized in 1968, and permits have been issued since then. We currently estimate the goat population on Kodiak at about 3,200 goats with all suitable habitat being utilized. Hunt areas boundaries and the numbers of drawing permits have changed over the years to reflect population trends and goat movements. Currently, over 5,500 applications are received during the annual winter drawing lottery for less than 500 goat hunting permits distributed in 7 separate drawing areas. The chance of being drawn varies from less than 2% for road accessible areas to greater than 5% for more remote areas. The southern portion of Kodiak Island is currently a registration hunt (RG480) in which the season runs from August 20th – March 20th and currently has a 2 goat bag limit. Registration hunts may occur in the northern hunt areas if the harvest goals have not been met during the drawing hunts. When harvest limits are reached, areas may be closed by Emergency Order.